Golden State trailed the Toronto Raptors 88-70 going into the fourth quarter last night. The Warriors won the game, 112-103. Yes, Golden State outscored Toronto, 42-15 over the final 12 minutes. The Raptors did not grab one defensive rebound in the fourth quarter, while the Warriors drained 8 of 11 3-pointers. From @EliasSports: Warriors beat Raptors after trailing by 18 after 3rd qtr, improving to 2-451 all-time when trailing by 18+ after 3. An Alabama fan has put all of his Crimson Tide paraphernalia on Craiglist and has vowed to never watch another game until Nick Saban is no longer the coach. Kobe Bryant and Lionel Messi have an amusing "Selfie Shootout" in this new commercial. The in way to prank one of your teammates in the NHL is to stick some bizarre object in their face while they’re giving a postgame interview. Jacoby Ellsbury signed a 7-year, $153 million contract with the Yankees last night. 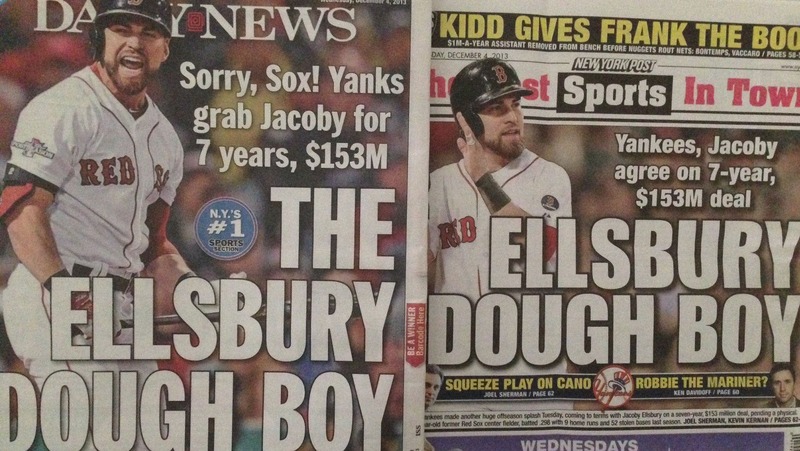 As expected, Red Sox fans sent vile tweets Ellsbury’s way, while the New York tabloids went after the same exact pun. If you want to skip all the Christmas movies this holiday, but still get in a little fix, you can just watch this mashup. Guyism.com has done extensive research to compile the 50 sexiest videos of 2013. * A Cleveland restaurant has named a burger after Browns quarterback Brandon Weeden, but it’s far from a compliment. * This movie poster sums up the Saints’ rough trip to Seattle on Monday. * John Caparulo is the latest guest to tackle some important sports questions for The Buzzer’s "Questions with Comedians" series. It looks like UFC ring girl Arianny Celeste may be in a Super Bowl commercial. The Big Buzz celebrates this news by giving her today’s Fox-y Lady honors.